1603: Okuni and her troupe dance the first "Kabuki Odori" (eccentric dances) on the banks of the Kamo river in Kyôto, close to the famous Shijô avenue. 1664: the Shimabara dramas (dramas using Shimabara as the scene of the play) are forbidden by the Shogunal authorities. Shimabara is a famous pleasure quarter in Kyôto. Spring 1694: the star Ichikawa Danjûrô I plays for the first time in Kyôto the role of the wicked priest Narukami. The drama's title is "Narukami Yûjoron" and it is staged at the Minamigawa no Shibai. The role of Princess Taema is played by Mizuki Tatsunosuke I. 1st lunar month of 1702: premiere in Kyôto at Miyako Mandayû's theater of Chikamatsu Monzaemon's drama "Keisei Mibu Dainenbutsu". The 2 leading roles are played by Sakata Tôjûrô I and Arashi Kiyosaburô I. Summer of Fall 1736: first (partial) Kabuki adaptation of the drama "Wada Gassen Onna Maizuru", which is produced at Miyako Mandayû's theater by Nakamura Tomijûrô I and is entitled "Hangaku Mon Yaburi" ("The Destruction of the Gate by Hangaku" in English); it stars Sanogawa Mangiku (Hangaku) and Sanogawa Ichimatsu I (Ichiwakamaru). 5th lunar month of 1739: first Kabuki adaptation of Matsuda Bunkôdô, Takeda Izumo I, Takeda Koizumo, Miyoshi Shôraku and Asada Kakei puppet theater drama "Hirakana Seisuiki". The play is produced in Kyôto by Mizuki Tatsunosuke II for the nadai Hoteiya Umenojô at the Minamigawa no Shibai [casting]. 1st lunar month of 1745: Chikamatsu Monzaemon's drama "Keisei Hangonkô" is performed for the first time in Kyôto, at the Minamigawa no Shibai [casting]. It is a long run and the performance is extended up to October. 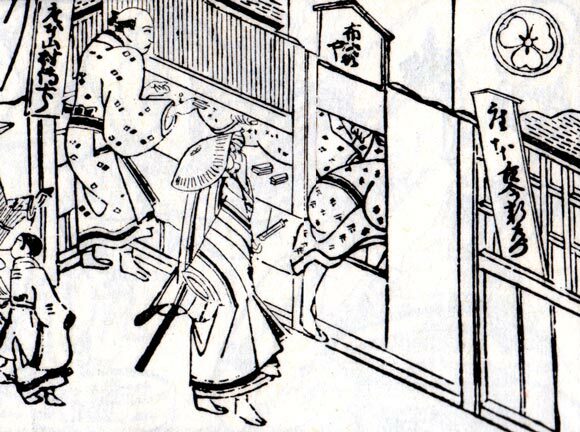 According to the chronicles, the play is simultaneously staged in another Kyôto theater in the 8th lunar month of 1745, at the Minamigawa no Shibai, produced by Nakamura Kumetarô I.
June 1903: premiere at the Meijiza (Kyôto) of Watanabe Katei's chûshinguramono "Goban Taiheiki", a revised version of one act of Chikamatsu Monzaemon's 1706 eponymous puppet drama. The leading role of Ôishi Kuranosuke was played by Nakamura Ganjirô I.
December 2016: Nakamura Jakuemon V celebrated his shûmei in Kyôto at the Pontochô Kaburenjô [more details]. January 2017: The Zenshinza troupe celebrates in Kyôto at the Pontochô Kaburenjô both the 85th anniversary of its foundation and the 40th anniversary of its early spring special performances in Kyôto [more details].